Wash and cut the strawberries into four pieces (set some aside for decorating). Squeeze the oranges, then add the sugar and the strawberries to the juice. Let marinate the mixture for about 30 minutes. Drain the strawberries and pour the syrup into a bowl. Line a 9-inch springform pan with parchment paper. Place the lady fingers in tight ring, cut-side-down. Dampen (do not soak) the remaining biscuits with the syrup and create the cake base. 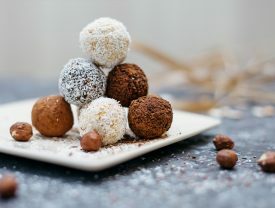 Whip 400ml of cream and stir in the icing sugar until the two ingredients are well combined. 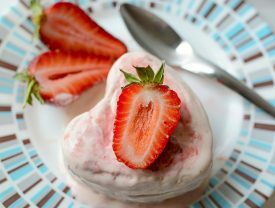 Alternate a layer of strawberries, whipped cream and dampen biscuits. End with a layer of lady fingers. Chill for about 8 hours or until firm. 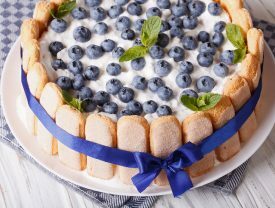 Before serving, whip the remaining cream and spread evenly on top of the cake. 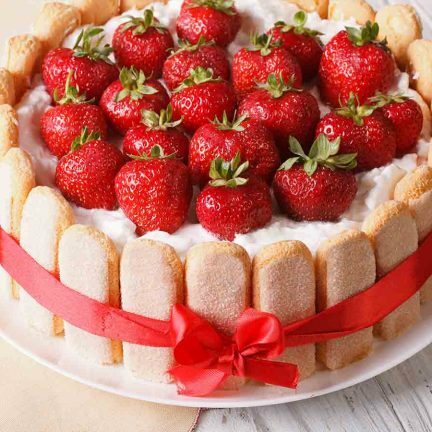 Decorate the cake with remaining strawberries.